There are a number of Church history timelines out there if you want to find them. They all support one argument or another. Of the ones I’ve found (via Google image searching) most seem designed to demonstrate how the more or less connected Eastern Orthodox churches are somehow, truly, the one, consistently intact, non-apostate church, by showing that both the Catholic Church and all the Protestant churches are apostate deviations from Eastern Orthodoxy. I don’t find these timelines or arguments very convincing (though I flirted with becoming Eastern Orthodox before entering the Catholic Church). 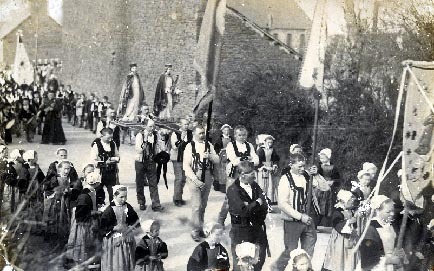 Very few timelines I’ve seen are about the histories of Protestant churches from a Protestant perspective for obvious reasons — pick any one and they don’t go back very far, and are rife with so many splits as to make one’s head spin. See this previous post for examples. Rampant disunity and proneness to division makes the Protestant churches visually impossible to establish their continuity with the Apostles (and opens the door to questions most Protestants would like to imagine don’t actually exist or are not important). Better to avoid that embarrassing visual altogether. Anyway, Protestants put their emphasis on other things. Yet, we get clearly from scripture that Jesus, with His apostles, founded a Church; that that Church is both mystical and visible, is marked by unity, is full of sacraments, and Hell will not prevail against it. Thus we should expect to find a clear line through history that we can call the Church. Given that all human beings are sinners, and that the Church is made up of sinners, then we should also expect an imperfect Church, prone to struggles, run through with sin, and teaming with problems — perhaps even its own periodic “dark ages” and times of great distress. But we should also see the work of the Holy Spirit, working on the hearts of the Church’s members, guiding the Church through the struggles, chastising it, correcting it, disciplining it, but keeping the thread of continuity always visible. If we are willing to entertain such an idea, it doesn’t take long to discover the Catholic Church is the best choice for being that church. All others, except to some degree the Eastern Orthodox churches, pale in comparison. But it’s not all that easy to find a timeline of Church history from a Catholic perspective. Perhaps that’s because Catholics don’t feel they need to create such a thing. 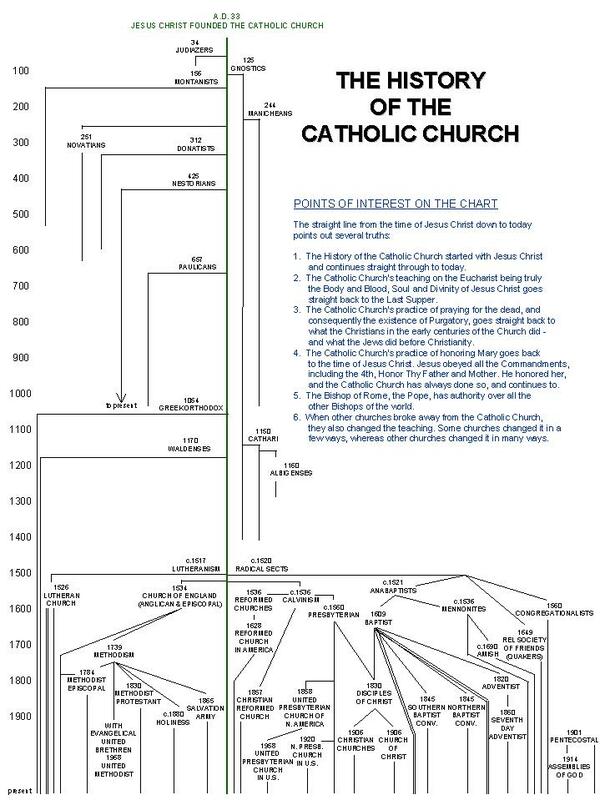 If the visual of this timeline means anything, then we see the Orthodox, Lutheran, Anglican, and Methodists grouped on one side, and all the rest on the other — which implies more or less deviation from the One, Holy, Catholic, and Apostolic Church — depending on which side one is on. Eastern Orthodox, Lutheran, Anglican, and Methodists — the diagram seems to say — are closer to the Catholic Church than those on the right. This is the traditional Catholic perspective, though it has changed in recent years as generally only Evangelicals, Baptists, and some Reformed maintained traditional moral positions (mainly on sexual, gender, and life issues) and the mainline churches have deviated substantially. My own history began in one of those Baptist strands on the right. I knew nothing about anything of Church history, and especially Baptist history. If Blessed John Henry Newman is right, that to be deep in history is to cease to be Protestant, then it’s no wonder Protestants (especially of the radical reformation) don’t want to know anything about their church histories — it’s too much of a threat to their way of life. I got the impression that our church had sprung directly from the pages of scripture, which allowed us to blithely disregard most all of Christian history from the death of St. John to the present day. Nearly everything I heard about the history of the Church could have been boiled down to a handful of repeated (and easily refuted) tropes about the Reformation and “those Catholics,” accepted with knowing nods, and never questioned. That was my experience. Of course, we never asked any knowledgeable Catholics about anything. Now we live at a time when questions of doctrine and dogma, Church history and practice, and the deep divisions among the faithful are shrugged off as being uninteresting. So much of Christian experience seems to reflect our broader societies values (beliefs are only personal and must remain so, faith is private, and choosing a church is more like choosing a new favorite restaurant) that people can’t see any purpose in asking if there is such a thing as one, holy, catholic, and apostolic church. While growing up Protestant, naturally I was told church history was unimportant — only Jesus and the Bible were important. But if the Church is the bride of Christ, then history matters — like your own history. You are a continuity of God’s grace in your life, and so is the Church. What is particularly troubling with this timeline is that it shows that Christians have been practicing separating (one could say divorcing) from each other for a very long time. As they say, practice makes perfect. What has this done to our souls? How has this spirit invaded our culture at all levels? Did Christ intend that they, and we, actually be one — implying visible as well as mystical unity? Can we really, over the long term, have the mystical and not the visible? Can we be divided in practice, in doctrine, in life, and still be okay that somewhere, somehow, we’re all unified in Christ? Like the hardness of heart Christ speaks of when he discusses divorce, is the Church in time and space, in hearts and in actions, an example to the world of the hardness of ours hearts? I think so. This is a profound problem. 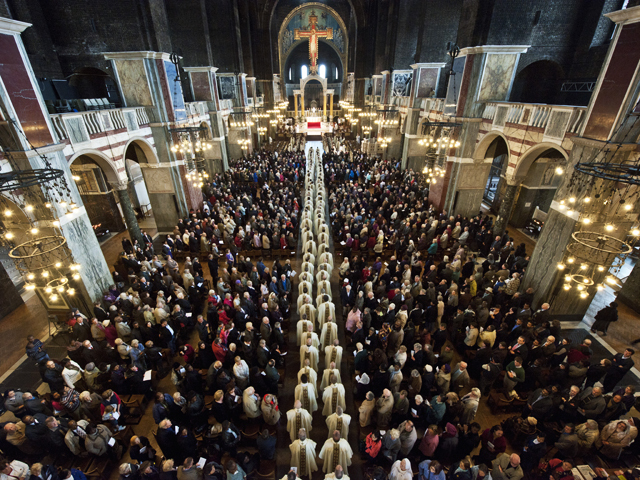 Chrism Mass in Westminster Cathedral, procession at the beginning. I have come to believe that once one cares at all about the continuity of the Church down through the ages, it then becomes clear all arrows point to the Catholic Church as the one founded by Christ. For all of its problems, and its crazy history, it remains. If one cannot imagine becoming Catholic, then it’s best to forget everything about Church history, grab one’s Bible, and just claim Jesus as Lord. Right? To many this sounds like a good plan, but that very perspective is at the heart of that crazy timeline of disunity, with Christians splitting from each other, with every man a pope, creating havoc among the faithful, and shaming Christ before the world. There is something profoundly broken and wrong-headed about the “me and Jesus” mindset as the foundation for being the Church. There is something profoundly broken and wrong-headed about betting on sola scriptura. The evidence is everywhere. This timeline shows that Christians have grotesquely failed in unity. Given human nature, original sin, and the incessant work of the Devil, this is no surprise. I have written about this before, but I believe the spirit at the core of the Reformation was the spirit of disunity (shored up by theological arguments that sound a lot like excuses), and that spirit has thrived down the centuries until today, and has affected all of modern culture — we are a culture of divorce on all fronts (we are constantly separating ourselves from others, reveling in our disunity, fighting against those “idiots,” and finding ever new ways to stay apart). But Christians should know that in and through Christ all those distinctions fade, and our human excuses disappear. Non-denominationalism (not caring about denominations any more) has not solved this issue. Evangelicalism has not solved the issue — though it embodies some good things. Cool churches in school gyms have not solved the issue. Gathering “outside” mainstream Christian culture in some small, radical biblicism enclave has not solved the issue. Social media, and our ability to be “connected,” has not solved this issue. Unity in Christ is hard enough, why then seek it and flaunt it? Because I know that at the individual level there are many, many Christians who passionately love Christ, I have hope for a coming unity once again. That unity will, and must, be both of the heart and visible; of faith and structure; of the mystical Church and the church down the street. May we humbly follow Christ and be “one” again. Post Script: Most Christians, as far as I can tell, could not care less about these things. This is true for both Protestants and Catholics. There is a happy cluelessness, a shrug and a “who cares?” or “I don’t see how that matters” attitude. I care, in part, because I was Protestant and converted to Catholicism. I had to wrestle with a lot of issues and claims raised by both “sides.” I was drawn by the Holy Spirit to wrestle with these things. I learned that history matters. It can teach us a lot. We each hold many assumptions and presuppositions, and those all have a history to them. I believe these are critical issues because I believe that truth matters, scripture matters, and what & who one has faith in matters. I don’t want to hold dear verses like John 3:16 …reveling in the love of God and feeling great, and forget that the Church, which was established by Christ, is also the body of Christ and the bride of Christ — something visible, living, breathing, acting, unified, in the world, reflecting Christ, and connected year over year through tradition, scripture, and structure. We believe in Christ by being a part of His Body. Belief is not about feelings only, or even mostly. One has to choose. I have to care, make wise judgements, and then choose. I cannot not care. I cannot not choose. 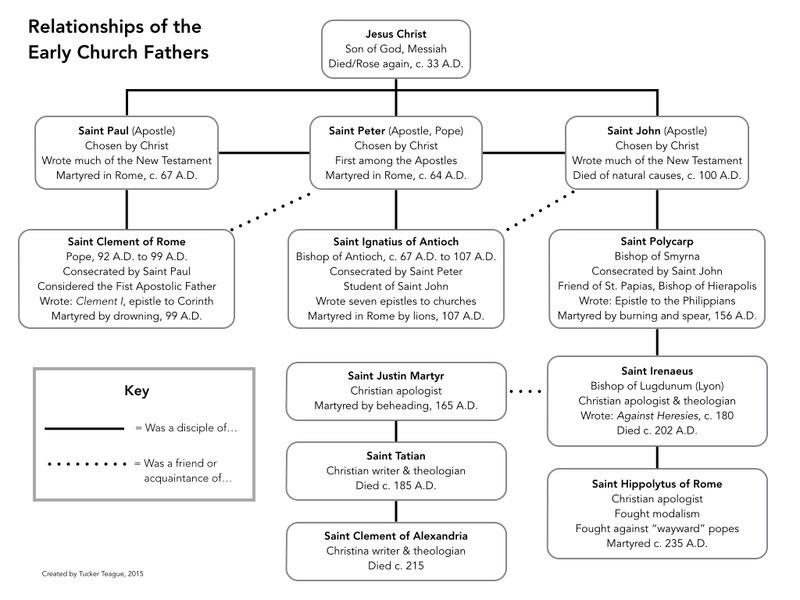 Here is my attempt to find some clarity on the relationships between the early Church Fathers, and how they connect back to Christ. I welcome feedback. There are some who want to believe that once the last Apostle died the church quickly went off the rails, fell into a kind of darkness, and did not begin to emerge again until the Reformation. This is silly bunk, and those who believe it tend to need it to be true so they can justify their own positions. This diagram points towards a more accurate, and “hermeneutic of continuity” understanding that sees the development of doctrine occurring right from the beginning as the Apostles handed down the Tradition of the Church to the next generation, which then did so for the next. That is one reason why, when curious Protestants go looking for their kind/style of church in the early years of Christianity, before the Catholic Church took over and ruined everything, they find the early Church was very Catholic. This is not proof that Catholicism is right and Protestantism is wrong, but merely points to the fact that the Church has always been Catholic.